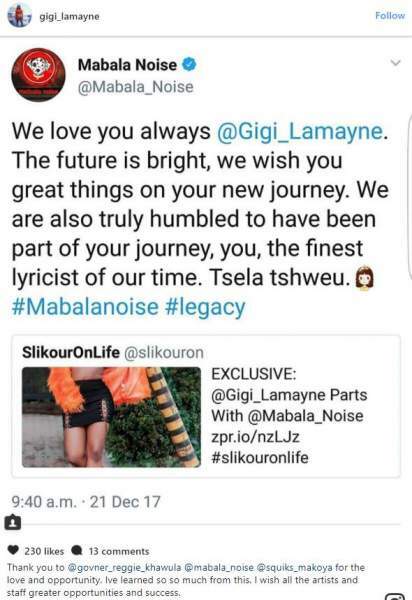 After a world of speculations and rumours, award-winning rapper, Gigi Lamayne and her record label,Mabala Noise, have finally parted ways. Following an amicable departure, the imprint took to their official Twitter page to wish Gigi the very best. “We love you always @Gigi_Lamayne. The future is bright, we wish you great things on your new journey. We are also truly humbled to have been part of your journey, you, the finest lyricist of our time. Tsela tshweu.👸 #Mabalanoise #legacy,” Mabala Noise Tweeted. The obviously elated Femcee whose real name is Genesis Gabriella Tina Manney also had kind words to say about Mabala Noise and offered shout-outs to the company’s set up. “Thank you to @govner_reggie_khawula @mabala_noise @squiks_makoya for the love and opportunity. Ive learned so so much from this. I wish all the artists and staff greater opportunities and success.” She posted on Instagram.